There was a glimmer of hope, however. The French, allied with the Americans since 1778, had landed six thousand troops in Rhode Island while the French fleet gathered in the Caribbean preparing to do battle with the British. General George Washington and the French commander, Comte de Rochambeau, met in May 1781 to plan their strategy. Washington wanted to attack the British in New York City. Rochambeau, fearful of attacking such a well fortified position and lacking confidence in the Continental Army's abilities, recommended marching south to battle Cornwallis in Virginia. Washington finally acquiesced to the French position and on August 22, the two armies began their march from White Plains, New York to Virginia arriving in early September. 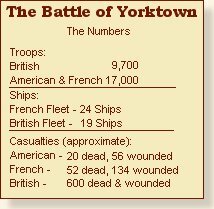 As the combined American and French armies marched south, a battle between the French and British fleets in the Chesapeake Bay sealed the fate of General Cornwallis and his British troops at Yorktown. 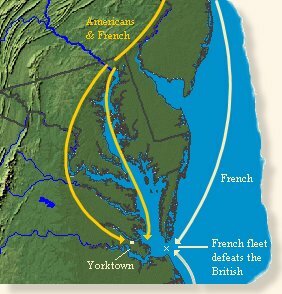 In the period from September 5 - 9, the French surprised the British fleet at the mouth of the Chesapeake forcing the British navy to retreat to New York, leaving General Cornwallis stranded. After a five-day bombardment, the combined American and French forces attacked and overwhelmed Cornwallis's fortified position on the night of October 14. The British commander was left with no choice but to surrender, which he did on October 19. News of the surrender reached England on November 25 sending shock waves through the British government. Although King George III wanted to continue the battle, the surrender forced Prime Minister Lord North to resign in March 1782. His replacement began the peace process that culminated in the signing of the Treaty of Paris in September 1783 granting independence to the American colonies. "At about twelve o'clock, the combined army was arranged and drawn up in two lines extending more than a mile in length. The Americans were drawn up in a line on the right side of the road, and the French occupied the left. At the head of the former, the great American commander [George Washington], mounted on his noble courser, took his station, attended by his aides. At the head of the latter was posted the excellent Count Rochambeau and his suite. The French troops, in complete uniform, displayed a martial and noble appearance; their bands of music, of which the timbrel formed a part, is a delightful novelty, and produced while marching to the ground a most enchanting effect. The Americans, though not all in uniform, nor their dress so neat, yet exhibited an erect, soldierly air, and every countenance beamed with satisfaction and joy. The concourse of spectators from the country was prodigious, in point of numbers was probably equal to the military, but universal silence and order prevailed. It was about two o'clock when the captive army advanced through the line formed for their reception. Every eye was prepared to gaze on Lord Cornwallis, the object of peculiar interest and solicitude; but he disappointed our anxious expectations; pretending indisposition, he made General O'Hara his substitute as the leader of his army. This officer was followed by the conquered troops in a slow and solemn step, with shouldered arms, colors cased and drums beating a British march. Having arrived at the head of the line, General O'Hara, elegantly mounted, advanced to his excellency the commander-in-chief, taking off his hat, and apologized for the non-appearance of Earl Cornwallis. With his usual dignity and politeness, his excellency pointed to Major-General Lincoln for directions, by whom the British army was conducted into a spacious field, where it was intended they should ground their arms. The royal troops, while marching through the line formed by the allied army, exhibited a decent and neat appearance, as respects arms and clothing, for their commander opened his store and directed every soldier to be furnished with a new suit complete, prior to the capitulation. But in their line of march we remarked a disorderly and unsoldierly conduct, their step was irregular, and their ranks frequently broken. But it was in the field, when they came to the last act of the drama, that the spirit and pride of the British soldier was put to the severest test: here their mortification could not be concealed. Some of the platoon officers appeared to be exceedingly chagrined when giving the word "ground arms," and I am a witness that they performed this duty in a very unofficer-like manner; and that many of the soldiers manifested a sullen temper, throwing their arms on the pile with violence, as if determined to render them useless. This irregularity, however, was checked by the authority of General Lincoln. After having grounded their arms and divested themselves of their accoutrements, the captive troops were conducted back to Yorktown and guarded by our troops till they could be removed to the place of their destination." Cook, Don, The Long Fuse: How England Lost the American Colonies, 1760-1785 (1996); Thacher, James, M.D., A Military Journal During the American Revolutionary War, from 1775-1783 (1827) excerpted in Commager, Henry Steele and Richard Morris (ed. ), The Spirit of 'Seventy Six v. 2 (1958). "The British Surrender at Yorktown, 1781," EyeWitness to History, www.eyewitnesstohistory.com (2002). The Comte de Rochambeau returned to France where he sympathized with the French Revolution. He became disgusted with the excesses of the Revolution, however, and was imprisoned. He escaped the Guillotine only because of the execution of Robespierre, leader of the revolution.